Bonded leather key tags are a hard wearing product which is able to be made in a variety of shapes. 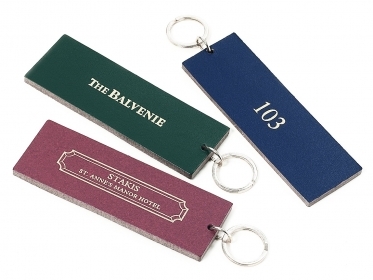 These key tags are able to be personalised with a silver or gold print with a matching loop fitting. Menu Covers | Wood Effect Menu Covers, Bonded Leather Menu Covers, Buckram Menu Covers, Pellaq Menu Covers, Laxey Vivella Menu Covers, Digital Menu Covers, Eclisse Menu Covers, Peluche Menu Covers, TM Menu Covers, Douglas Menu Covers, Jurby Menu Covers, Ramsey Menu Covers, Poly Menu Covers, Snaefell Menu Covers, Wood and Buckram menu covers, Full Saddle Hide menu covers, Shabby Chic, Digital Aluminium Menu Covers, Wooden Menu cover. Bill Presenters | Bonded Leather Bill Presenters, Buckram Bill Presenters, Douglas Bill Presenters, Wood Effect Bill Presenters, Eclisse Bill Presenters, Vivella Bill Presenters. Placemats | Douglas Placemats, Melamine Placemats, Peel Bonded Leather Placemats. Guest Room Folders | Bonded Leather Guest Room Folders, Buckram Guest Room Folders, Digital Guest Room Folders, Eclisse Guest Room Folders, Pellaq Guest Room Folders, Peluche Guest Room Folders, Vivella Guest Room Folders, Douglas Guest Room Folders. 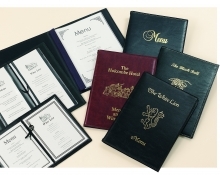 Accessories | Menu Cover Corners, Pockets, Menu Cover Tassels, Menu Cover Tag Fixings. Menu Boards | Wood Effect Menu Boards, Buckram Menu Boards, Pellaq Menu Boards, Vivella Menu Boards, Bonded Leather Menu Boards, Eclisse Menu Boards. Conference Mats | Conference and Reception Mats. 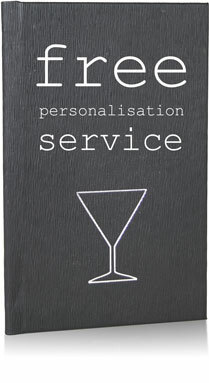 Custom Products | Special Custom Products. Do Not Disturb Signs | Do Not Disturb Door Hangers. Key tags | Bonded Leather Key Tags, FOR Key Tags. Clip Boards | Aluminium Clip Boards. Hotel and Restaurant Signs | Hotel and Restaurant Signs. Copyright © The Carrick Leather Goods Ltd. | All Rights Reserved | Company Registration Number: 2137228.